I just threw these data sheets together for my kiddos and figured I might as well share! Maybe it will save someone the time of creating their own. 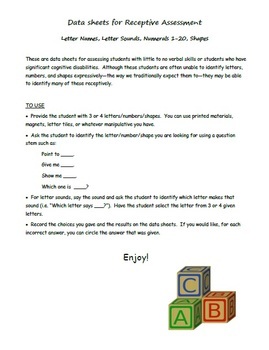 These are data sheets I use when I assess my students with significant cognitive impairments. Although these students are often unable to identify letters, numbers, and shapes expressively (verbally) -- the way we generally expect our students to -- they are sometimes able to identify these things receptively. Basic instructions are included in the document, but the gist of it is that you provide your students with 3 or 4 options and ask them to select the correct one. 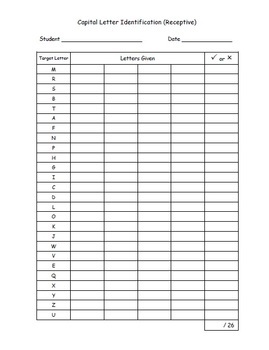 These data sheets cover just a few basic kindergarten skills: letter names, letter sounds, numbers, and shapes (the 9 shapes that Common Core covers). 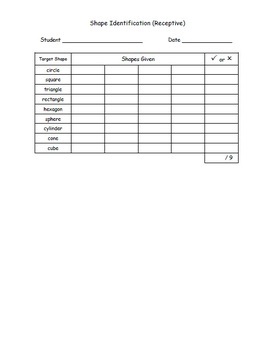 However, these data sheets may also be useful for older students who are working on these skills. They are not only useful for students with significant cognitive disabilities, but they may be helpful for other students who have little to no verbal skills. 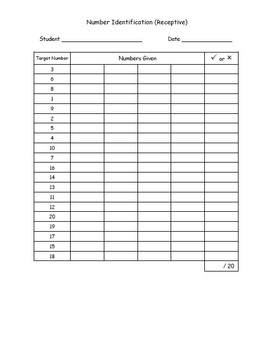 There are many other wonderful assessment recording pages out there, and I know that not everyone will find this format to be the most convenient or effective, but this is what works for me. I hope someone else out there could benefit from it!